This new DNA tool can be found here. It's just a little bit of fun. It requires results from your DNA test results run through the Eurogene K36 calculator (available on GEDmatch). I've previously explored my Ancient Ancestry from this period in the post Celebrating my Ice Age ancestors. I've previously explored my Ancient Ancestry in the two posts Celebrating my Neolithic Ancestors and Celebrating my Steppe and Beaker ancestors. 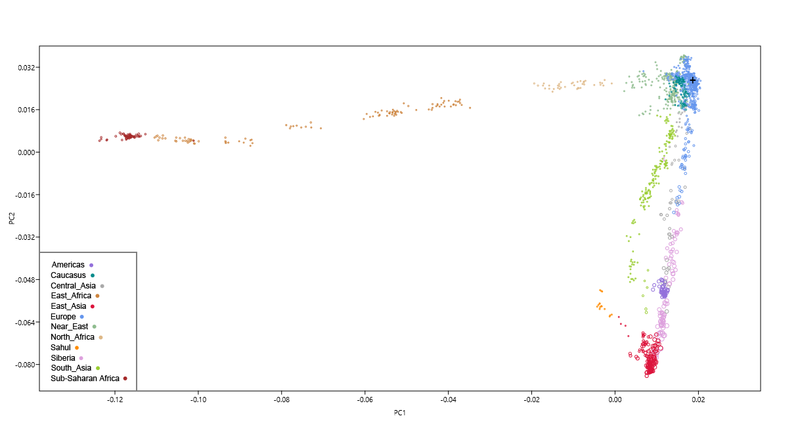 The results look a little weighted towards the "Indo-European" (Copper Age Steppe Expansion), and this repeats when compared with my other ancient calculators. I suspect that my actual European Neolithic (Early Farmer) percentage is a little higher than 28%, and my IE rather lower - but it's all just fun. In addition, I'd still stay clear of labelling the Steppe Expansion as "Indo-European" or entering the linguistic debate. Finally, the 15,000 year old map. I think that it plays down some of our ancestry from Asia north of the Caucasus, or at least Eurasia, and would be better labelled ﻿Western Eurasia﻿ than as Total Europe. My Y line proves that I have some Ice Age ancestry from SW Asia, from the area of Iran. Of course, this is the issue with any test on autosomal DNA, it's going to rock around, even between siblings, due to each random recombination. However, an excellent tool, thank you to the creator. 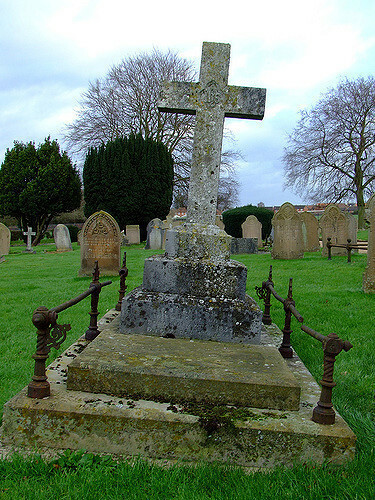 The above grave is of my great great grandparents Robert and Ann Smith at Attleborough, Norfolk. First of all, it's looking good on the Y-Front. My Y111 sample kit has arrived from FTDNA. I also sent my 23andme V4 raw data to the administrator of the FTDNA Y Haplogroup. He replied the next day "the raw data confirms that you are positive for M317 and negative for downstream SNPs M349 and M274. A very rare result for a NW European. It will be interesting to see who are your closest matches at 67 and 111 markers.". So it doesn't look as though my L1b has anything to do with the M349 Rhine-Danube cluster. I wonder where it comes from, how and when it got into an English ancestry? It's starting to dawn on me just how rare it is in NW Europe. 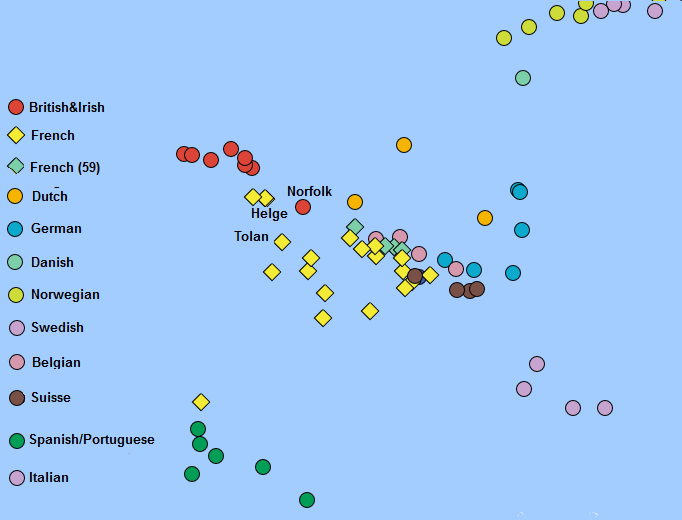 European Y-Haplogroup maps and tables simply don't display or list it, because Y-DNA Hg L is not even considered a European Haplogroup, nevermind on British Haplo-maps. All of those R1b's and I2's. Not an L in sight. I can see that having an unusual haplogroup is a mixed blessing. Sure it's interesting, but no one knows much about it, because there is so little data on it in Europe, and so little research. I had my first case of disbelief of my L1b Y-DNA on an FTDNA surname project group. I reported my Y haplogroup as reported by 23andme (using ISOGG 2009) as L2* The administrator retorted "It is NOT the "L" haplogroup, instead, it is "I". So I linked her copy of my 23andMe Paternal line report. This time she replied "Goodness gracious Paul. I administer many, many projects and yours is the first "L" You see, it has problems. Wouldn't it be just great if I found someone else descended from the Berkshire Brookers by their Y line, that had the same haplogroup? GEDMATCH offers free tools for analysing the autosome DNA of your raw data, from 23andme or Ancestry.com. One suite of tools that are useful for analysing population admixture, are the Eurogene. As an English person, with strong paper English ancestry - including almost certainly early medieval admixture, I thought that I'd get a comparison out of the way. See which "works" best for my known ancestry and likely heritage. I'm trying oracles on my 23andMe V4 raw data, for 1. EU Test, 2. K13,and 3. V2 K15. A bit strange that it sees me as first "Cornish". I don't know where it got that reference from. I have no known Cornish ancestry. However, 2 and 3 are likely. As a whole it's not a bad prediction, just that the ball landed a bit to the West. What about mixed populations? What are it's favourite admixtures between two populations for me? Okay, not bad - it's given up on the Cornish. However, it seems to point to France, Spain, and Portugal as a secondary source. That is eerie, because 23andme threw up a speculative 2.4% South European including 0.5% Iberian. I do wonder if I actually do have some unrecorded South European ancestry, even Iberian. I like K13. The Dutch may be there in admixture, and I know that they do often share some common patterns with SE English. So I can excuse it making it to position 1. Then in second place, the ball scores a goal. Yes, I am SE English. Most of the other suggestions could represent ancient admixture. How about two population proposals? It's got the SE English spot on, but all of these Iberians again! Is it trying to tell me something? Very good, except again, a bit skewed to SW England. However, to be fair, I do have some slightly westward ancestors in the Oxfordshire area. The rest is spot on. What does it offer as a hybrid? Those Spanish again! Goes for SW English over SE English as the primary ancestral population. Out of these predictions, my gut feeling is that they are all good for single population match. On two population mix, they all suggest Iberian minorities. Either I have an undiscovered South European ancestor, or something else is going on. Do other English get this? I can't really pick a winner.